The Launch Pad™ is now accepting applications from successful entrepreneurs seeking to pitch their ideas, products or services to investors live at LTB 2015… and land a $1 million investment. Submit an application for your chance to soar; consider it one giant leap for business. LTB (Let’s Talk Business) is an education platform designed for and by Jewish business leaders. Offering first class business education, individualized support, and a wide array of events and programs, our mission is to help you grow yourself, your company, and your profits. Welcome to LTB: Let’s Talk Business. This is the Jewish community’s premier business education and networking community, and I invite you to be a part of it. What started in 2013 as a one-day event, the LTB Summit, has grown into an unrivaled platform that fuses knowledge, tools, and resources into a singularly vibrant experience. LTB has ignited a movement, impacting so many lives and helped countless Jewish entrepreneurs and businesspeople learn, grow, and succeed. With our Leaders Forum program for executive level business leaders, online networking opportunities, free tools and resources, and an annual summit for entrepreneurs and business leaders to gather, learn and connect, there is no doubt that when it comes to shaping the landscape of Jewish business education, we’ve set the bar. It’s so gratifying for me to see not only the growth of the LTB initiative, but the incredible impact the LTB initiative has made over the last few years. I’ve received hundreds of emails from participants in our programs who’ve successfully implemented the many lessons and strategies taught—changing their businesses, and their lives in the process. To my fellow entrepreneurs and business people: I admire your strong work ethic; your pioneering vision; your passion for achieving new milestones. And I’m delighted to welcome you to LTB. Spend a day immersed in business leadership to set your vision and mark the path towards your business goals. A follow up program of the Leaders Forum, this mastermind group will help keep you motivated, and accountable. The Orthodox Jewish community’s premier business education and networking event. A place to learn, grow and share ideas with other entrepreneurs. Based on past attendee statistics, the projected attendance at LTB 2015 is slated to hit the 1,000 person mark. Who will be there? Corporate executives, business owners, entrepreneurs, and employees hailing from across North America – uniting a lucrative market of leading Jewish businesspeople in numerous fields. You'll learn about innovative, visionary business ideas that solve problems and change perspectives. Spend a day outside the office to develop a fresh mindset that embraces change, fosters creativity and advances your leadership potential. You’ll hear powerful strategies delivered by business experts, community leaders, successful entrepreneurs - and they’ll be telling you all about the easy-to-implement tools and tactics you’ll need to transform yourself into a business trailblazer. You'll be sitting in a unique environment that's buzzing with entrepreneurial energy and industry spirit. Gain a sense of empowerment and motivate yourself to skyrocket upward and tackle new milestones in business - and beyond. You'll be networking with a very diverse crowd of active and serious businesspeople. They’re all looking to grow bigger and achieve higher levels of financial success. Here's your chance to make the right connections and go places. You'll be presented with a wealth of high-value resources to help you guide your ambitions, persuade you to think out of the box, and imbue you with a sense of passion to climb up the corporate ladder and lead like never before. What does LTB stand for? “Let’s Talk Business.” Because we believe that great things begin with a handshake and a good conversation. Powered by Ptex Group, LTB (Let’s Talk Business) is a revolutionary platform dedicated to bringing together a coalition of success-driven Jewish entrepreneurs and businesspeople, and providing them with powerful tools needed to learn, grow and succeed. LTB is for Jewish business leaders—and aspiring leaders—who want to increase their knowledge and grow themselves, their teams, and their profits. LTB gives you the best of both worlds: access to the latest and greatest ideas in business, in an environment you can feel comfortable in. Plus, we serve kosher food and never host conferences on Shabbos. Can’t I just learn all the same things for free on the internet? You can google business advice to your heart’s content, but we believe that the best way to learn is by speaking to business leaders who have reached success themselves using proven principles and methods. That’s why, at LTB, we curate the best content, speakers and ideas. Our interactive content and individualized programming ensures that you get the exact answers you need to help your business flourish. Do you offer corporate trainings? Yes. Whether you’re hosting a corporate event, or just looking to take your employees to new heights, contact us to book a speaking engagement. This proved to be one of the best investments I ever made in my business. The Leaders Forum is packed with techniques that the most successful business leaders use to reach success. I meet people daily that would succeed twice as much using these techniques. I can't recommend it enough. I enjoyed the Leaders Forum immensely. My business will never be the same because of it. The LTB Summit was an eye-opener. The event showed me the world beyond my office cubicle, and how much our organization can benefit and grow. I'm a hard-working small business owner. Having attended the Leaders Forum, I can definitively say this is a life changer. The investment is nothing compared to the results. Had I done this 4 years ago, I would be much further ahead. - Solomon Schwartz, Co-Executive at E Custom Wear Inc. The tools and mindset learned at the Leaders Forum is fundamental not only for addressing immediate challenges, but for building a stable, and big, future for your business. Plus, both the environment and content make everyone feels at home! Learn the proven strategies that successful leaders use to stop dealing with hundreds of overwhelming tasks—and free up more time to grow your business. 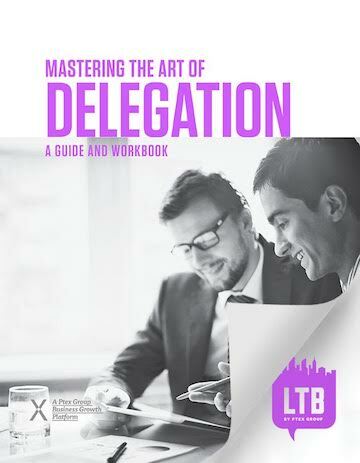 Download this free guide and workbook to start mastering the art of delegation. Awesome! Your guide is on its way to your inbox.